If there is one single diet buzz word for 2017, it may just be Flexitarian. What is a flexitarian? As you may have guessed it is a more flexible take on vegetarianism. The diet, which is really a lifestyle change, focuses on mostly plant-based meals with occasional meat, poultry or fish consumption. Flexitarianism is being recognized by dietitians and health experts for its nutritional completeness ease in keeping up long term, and long-term weight loss. Flexitarian diets naturally increase the intake of vegetables which are high in the heart-healthy fiber that many Americans are lacking in their diets. Decreased intake of animal proteins also decreases the amount of saturated fats and cholesterol consumed. Physical health. Plant-based diets have been shown to decrease BMI and blood pressure and also reduce the risk for obesity, diabetes and cardiovascular disease. Plant-based diets are naturally high in fiber, vitamins, minerals, healthy fats and water while leaving behind the unhealthy fats found in meats. Worried about your protein? Don’t be. A person weighing 175 pounds only needs about 70 grams of protein a day. One cup of edamame contains 18 grams of protein, that’s 25 percent there. Reach your protein goals by filling your plate with beans, nuts, whole grains, tofu and tempeh. For more information on plant sources of protein, click here to check out this great article from the Academy of Nutrition and Dietetics. Financial perks. Contrary to popular belief, eating healthy doesn’t have to cost much. Beans and grains are very inexpensive and, in most recipes, frozen or canned vegetables can be used in lieu of fresh. Frozen and canned foods also have a longer shelf life which increases the likelihood of you using them before they go bad. Throwing out expired food is like throwing out money. Lower fat, unprocessed meats can be pricey even before you consider the cost of free-range, grass-fed, hormone-free meats. Swapping inexpensive vegetables and beans adds bulk to your dish while trimming down the cost. Environmental effects. Vegetables and grains are inexpensive. So inexpensive they are fed to animals being raised for consumption. When you pay for meat you are also paying for the foods they have already eaten. Rather than pay for your food’s food, eat it yourself. Reducing meat consumption reduces the amount of feed that needs to be grown, harvested and transported from farm to farm. Reducing meat consumption also reduces the amount of water needed for grain production, cleaning and animal hydration. The beauty in flexitariansim is, well…the flexibility. Do you want to eat meat on the weekends? Do it. Do you want to reduce your meat to once a day? Great! Do you want to eat meat socially? You can! Ultimately, you get to decide. 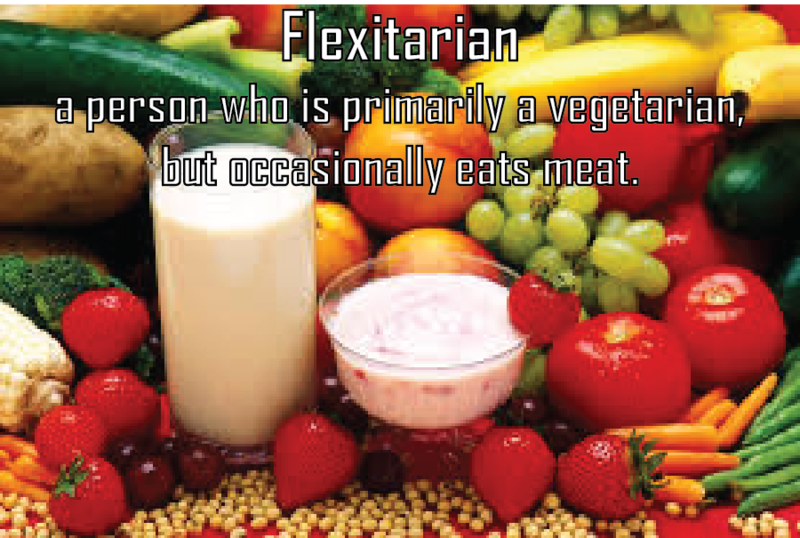 Flexitarian shouldn’t be considered a restriction but a great way to improve your overall nutrition intake.